If you have decided to take vitamin B12 and biotin, reach for Maxi B12™ with Biotin from your health partners at Maxi Health Research®. Vitamin B-12 is essential for healthy nerve cells. It is a key micronutrient that supports lymphocyte cell function. Biotin is a cofactor for several enzymes and supports carbohydrate metabolism, protein synthesis, growth and development of healthy nerve tissues, utilization of B vitamins, and synthesis of ascorbic acid. 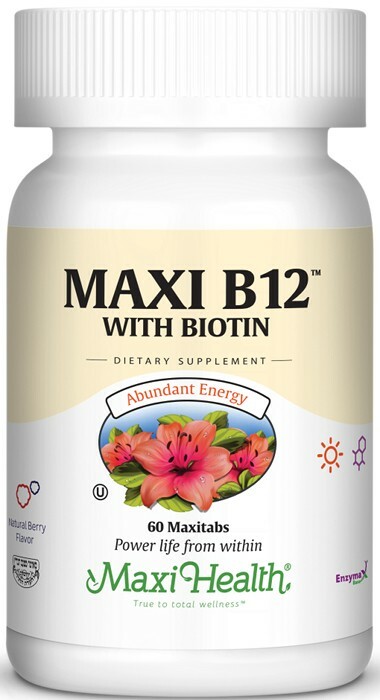 With Maxi B 12™ with Biotin you will get 5000 mcg of each, by taking just one convenient tablet. “B” wise! “B” Healthy! Get Maxi B-12™ with Biotin! Chew one (1) tablet in the morning, or as directed. Other Ingredients: Sorbitol, fructose, croscarmellose sodium, maltodextrin, magnesium stearate, Enzymax® (calcium carbonate, bromelain, papain, lipase, amylase, protease, silica), natural cherry and strawberry flavor, cornstarch, acacia gum, and silicon dioxide. This product contains no animal products, wheat, gluten, yeast, salt, milk, artificial preservatives, flavors, or colorings.